I like fish. But sometimes, it is not easy to cook a good piece of fish. The fish always turn rough and mushy. Salmon is probably the easiest to handle, and it is ok to be eaten raw. Recently, I found out that I really like crusted fish. The crust gives the fish some crunch. Love the texture! 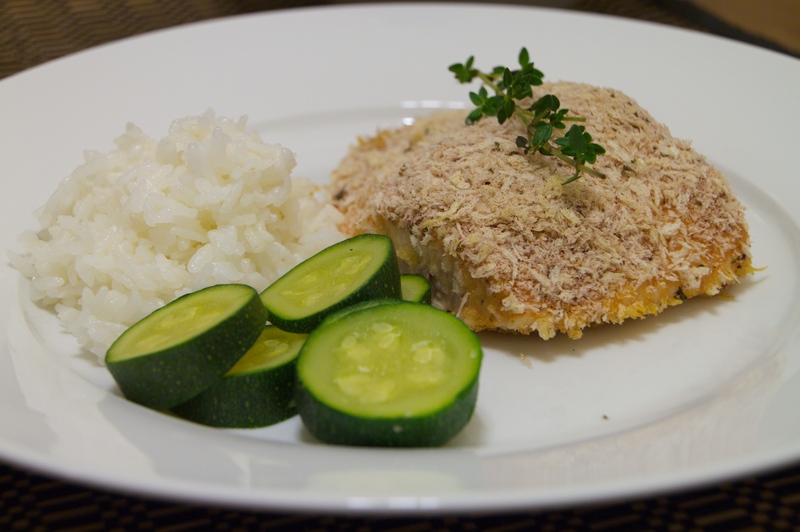 This panko-crusted salmon is very good. It is so simple and easy. It can be done in less than 30 minutes. Preheat the oven to 425˚F. Cover a baking sheet with aluminum foil. Lightly oil the aluminum foil to prevent stickiness with the fish. Place the salmon on the baking sheet. Season with salt and pepper, and then set aside. In a bowl, combine the mustard and honey. Stir well until combined. Spread the mustard mixture over the salmon fillets. Don’t be afraid to put more, because all the flavors would be from the glaze. In another bowl, combine the panko, paprika, and thyme. Sprinkle the panko over the salmon. Bake the fish for 12 to 15 minutes. Serve and enjoy! This entry was posted in Cook, Seafood and tagged fish by Lokness. Bookmark the permalink.